The best time to buy workout clothes at secondhand stores is early February. I don’t know this for sure, but it’s always when I discover the best Athleta, Columbia, and Adidas gear at mind-blowing prices. I’ve found pieces that look brand new, and I have a guess as to why. People buy workout clothes in January as motivation to exercise, and once they realize it isn’t going to happen, they get rid of them. It’s basically a backwards sticker chart for grownups. Extrinsic (or external) motivation rarely works for grown-ups, and it rarely (at least with long-term results) works for children. Sometimes I’m tempted to introduce a sticker chart for bed making, dog feeding, or good big-sistering (my own word, I know.) Sticker charts seem to be the first place our minds go to when faced with a parenting challenge. But I have to remind myself: sticker charts and rewards systems don’t have a place in a Charlotte Mason home. Sticker charts and other rewards seem to be a quick fix for motivating children, but they can actually hurt more than help. This post contains affiliate links. Read more in my policies. (Sign up for my newsletter to receive an explanation of this synopsis). Brandy Vencel from Afterthoughts Blog explains Charlotte Mason’s use of the word suggestion as “a subtle sort of manipulation.” I used plenty of sticker charts, pizza parties, and incentive jars during my public school days, and I’m not sure they fit into the “subtle” category! Offering rewards in the form of sticker charts, pizza parties, or incentive jars, whether at home or at school, doesn’t show respect to the personality of children. It plays upon a child’s natural desire for junk food, or pretty, shiny things. And in case that doesn’t convince you, there are many more reasons. Education expert Alfie Kohn wrote a lot about the topic of rewards- he devoted an entire book to it. (You can read the article The Risks of Rewards here, or see his book here .) Kohn mostly discussed rewards used in classrooms, but one example stood out to me. I’ve probably said this before, but I love how so much of Charlotte Mason’s works align with modern-day research! Here are the downsides of these rewards- some of them are from Charlotte Mason and Alfie Kohn. Children become disinterested in whatever they were bribed to do. Rewards don’t encourage children to grow into people who care. Giving lots of rewards develop children who are less generous than their peers. Rewards don’t change underlying emotions that affect behavior. Children “motivated” by rewards aren’t as inclined to think creatively, explore new topics, or accept challenges. Introduce inspirational ideas that help to inspire and motivate your child. Because of human nature, some of the things we tend to bribe our children to do are just habits that haven’t been formed yet. 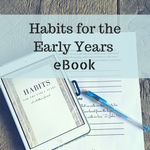 Instead of bribing with rewards, work on forming positive habits in the early years. Become your child’s “friendly ally” rather than carrot dangler. Work with them to help them achieve the goal. Identify your child’s rights and privileges. This allows us to consider if we really have to allow our child to eat dessert, or play a game on the iPad. These don’t necessarily need to be used as rewards or incentives, but having no consequences for difficult behavior can (will?) lead to entitlement. Use natural and relative consequences. I explained this more in the eBook that I recently wrote, but basically, allowing your child to experience the natural consequences of their actions, or coming up with a consequence that is related to the behavior offers a gentle learning opportunity for your child. Mamas, let’s fight this sticker chart culture, and raise kids that are motivated for the right reasons. You made some good points! Sometimes they need a little help to become internally motivated. Having a visual reminder of what we’re working on would be really helpful! I agree that finding a balance is key! And I’m probably not as anti-rewards as my article seems (like I mentioned- dessert!!) From my personal experience, though, keeping rewards out of learning is so very beneficial! Yes to all of your points!! I teach my daughter that we clean up because we’re thankful for the house and toys that we have. I want to inspire her, not bribe her!